In a study published in Cancer Cell, researchers at the Francis Crick Institute, King's College London and Barts Cancer Institute discovered that acute myeloid leukemia (AML) – the most common acute leukemia affecting adults – causes bone marrow to 'leak' blood, preventing chemotherapy from being delivered properly. Drugs that reversed bone marrow leakiness boosted the effect of chemotherapy in mice and human tissue, providing a possible new combination therapy for AML patients. AML is relatively rare – approximately 2,600 people are diagnosed in the UK each year – but as it mainly affects people over 65, prevalence is likely to increase with an ageing population. It is a particularly aggressive cancer, with fewer than a quarter of patients living for five years after diagnosis. * Chemotherapy resistance and relapse are a major problem in treating the disease. Next, the team tried to understand what caused the bone marrow in AML mice to become leaky by studying molecular changes in the cells lining the blood vessels. 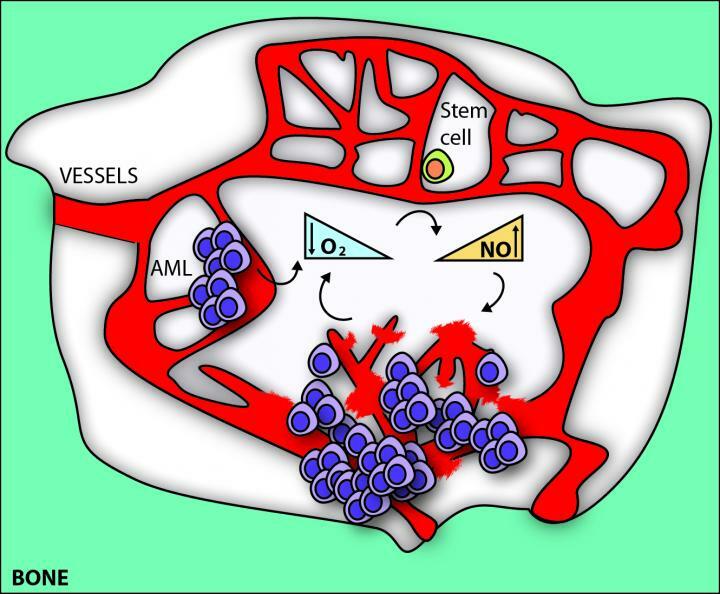 They found that they were oxygen-starved compared to healthy mice, likely because AML cells use up a lot of oxygen in the surrounding tissue. In response to a reduction in oxygen, there was an increase in nitric oxide (NO) production – a molecule that usually alerts the body to areas of low oxygen.